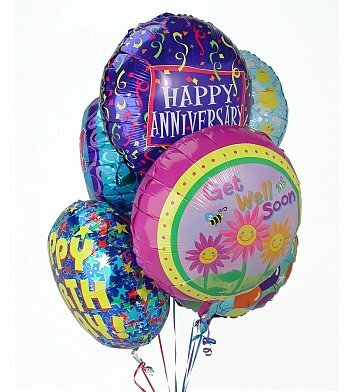 This luminous bouquet of a half dozen themed balloons is a superb way to celebrate many different occasions. *Please note: For Father's Day Mylar balloons some substitutions may be necessary, examples might be "You're the Greatest", "You're #1", "Thinking of You", etc. Balloon Bouquet-Half Dozen Themed Mylar is a hand delivered gift. These gifts are delivered by one of our local design centers located throughout the United States and Canada. Same day delivery is available for most gifts when ordered before the cutoff time. The cutoff time for Balloon Bouquet-Half Dozen Themed Mylar is 2 PM in the recipient's time zone. The balloons were ordered online for delivery to another state. They did a nice job with the display and they were delivered in a timely fashion. This is a good company with good customer service. My son was surprised! Thank you for making the effort to deliver at the requested times. I was able to see my order when I visited my son over the weekend and was happy with the number of balloons plus all the beautiful colors. Your website is easy to use to place an order and the price was good. Overall, my experience was very good. You kept me in the loop on the delivery and I appreciate that communication. to have such a festiveness to the special day. Very accommodating & easy to work with! Ordered balloon bouquet & needed to be delivered after 5. They were very accommodating & very nice & very helpful! Prices very reasonable too! I will order from you again!! Thanks for doing exactly what you said you'd do!! The birthday balloons for my Dad looked amazing just like they were advertised. Will definitely order from here again. I am extremely pleased with the ballon presentation, delivery and website. My 4 year old grandaughter loved getting balloons from her Oma across the country. Was told that is was beautiful and my nephew loved the balloons and the bear!! Perfect. Thank you and I would highly recommend. I ordered this online from Montreal, Qc. Canada to be sent to Florida. I was told by the recipient that the bouquet of balloons was awesome!!!!! Ordered them for my dad as a way to brighten up his condo. This is the second time I ordered these... the first time was last year and the balloons stayed inflated for months! Delivered when they were supposed to be and everything was great. Thanks! Recipient loved the balloon bouquet! They arrived on time on Feb 27, 2014 and still look fabulous 2 weeks later. I'm truly happy with the service and will use this service again!!! Great job would definetly use again! Could not find what I wanted on website. Called vendor. They were very cooperative and helpful. Balloon Bouquet delivered on time. Pleased with response from our son. Bought birthday Mylar balloons with bottle of wine. Rhonda, the customer care rep could not have been more helpful. Everything arrived as promised. My sister-in-law was thrilled. And her grandkids loved the balloons. I surprised my girlfriend with these balloons and she loved them, and the teddy bear that can with it. It is costly to ship gifts and this shipment was no exception. It got there on time and made my girl happy, and that, makes me happy! Very happy with the service. Arrived very quick within a few hours of order being placed. Very happy son. Will order from here again. Thank you.